I continue to coordinate a series of Design Challenges for the Energy Innovation Center (EIC). The program includes high school students from the Parkway West consortium of schools. 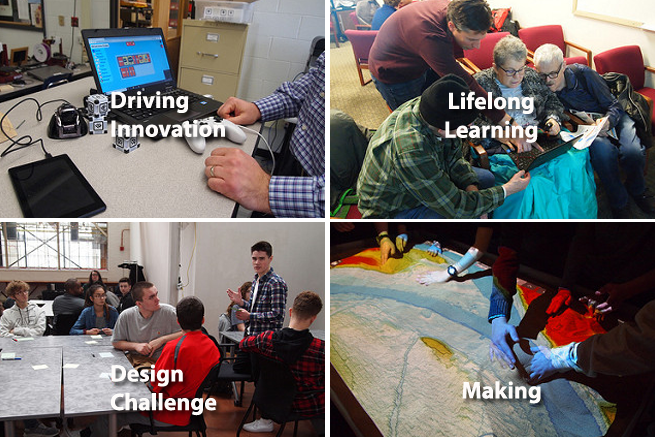 For the winter term three student teams will work on “A Safety Plan” and another team of three schools will work on a Design Challenge that focuses on the development of a “food kit” for the Energy Innovation Center. For both Design Challenges the EIC has enlisted the help of a series of experts to guide the process. For the Safety Plan the Community of College from Allegheny County (CCAC) is sharing its Director of Safety and Security, while SimTable, a breakthrough technology for safety incident training and modeling, will provide its technologies for the student consultants to use. For the Food Kit Design Challenge Chatham University’s CRAFT team will assist the students as well as 412 Food Rescue. Both projects demonstrate the power of real world learning with teams of experts working with the student consultants from the kick-off to the final presentations. I’m hoping that the Design Challenge project will be one of the ten Spotlight on Innovation projects selected by Remake Learning to present at the HundrED Conference in Helsinki in November 2019.
and Aileen Owens from South Fayette explaining how to Sustain and Scale Innovation. During the upcoming months I hope to work with the Community Day School, Fort Cherry, and some of the Parkway West Schools on a Sustainable Energy project connected to technology from AYA Instruments. Last year AYA provided training for one of the Parkway West teachers to use a monitoring system with solar panels. This year we expect to see some of the Parkway West students install a Discovery Zone at their home school and maintain the system based on their training at Parkway West. The Community Day School in Pittsburgh plans to install a Discovery Zone this year and share data with other schools, including Fort Cherry which already has a Discovery Zone in place.